On the 50th Anniversary of the institution, SFU launched an ambitious engagement process to map out and envision what a “sustainable SFU” would look like in 20 years. The yearlong engagement process led by the SFU Sustainability Office invited the entire SFU community of students, faculty, staff, senior leadership and alumni to provide their input on the University’s long-term sustainable future. Over 4,000 SFU community members contributed to the engagement process and helped develop core themes that were then refined into a 20-year University sustainability vision and 20 sustainability goals. With SFU’s Sustainability Strategic Plan (2013-2016) coming to its last year of implementation, SFU President and senior leadership encouraged the Sustainability Office to embark on a University-wide engagement process that would provide a blueprint for SFU’s long-term sustainable future in the form of a 20-Year Sustainability Vision and Goals for the University. The main goals of this ambitious engagement process were to: 1. Involve the SFU community of students, faculty, staff and alumni in shaping the University’s long-term sustainability vision. 2. Provide the SFU community with the necessary information needed to participate in a meaningful way. 3. Communicate the SFU community’s sustainability aspirations to decision-making bodies of the institution. Phase 1: The first phase of this project focused on process planning, preparation and communication. Highlights include: Securing approval from SFU’s senior leadership to embark on a University-wide engagement process to develop SFU’s 20-Year Sustainability Vision and Goals. Designing an inclusive engagement process using the International Association for Public Participation (IAP2) principles and framework adhering to its core values of: o Incorporating public contribution in to decision making, o Bridging existing gaps between decision makers and the community impacted by those decisions, o Providing tools and resources to ensure the community is equipped to contribute to the decision-making in a meaningful way. * Designing and launching the Sustainability Reporting Initiative (SRI), an online platform to showcase SFU’s sustainability achievements to date. Phase 2: The second phase of the project focused on executing in-depth community engagement, feedback analysis and the drafting of the first iteration of the University’s sustainability vision and goals. Highlights include: Partnering with SFU’s Centre for Dialogue to plan three half-day in-depth dialogue sessions, one at each of SFU’s three campuses. Developing a Community Conversation Handbook made available to the SFU community through the Sustainability Office website to encourage smaller, more intimate conversations among the community on the institution’s sustainable future. Distributing the first of two community surveys to the entire SFU community of students, faculty and staff seeking input on SFU’s sustainable future. Distributing SFU’s sustainability achievement information sheets to educate the community on the following topics: energy & emissions, mobility & travel, consumption & waste, learning & discovery, society & equity, and risk & resilience. Identifying five recurring themes through a closer review of the rolling community feedback: Circular Economy, Climate Resilience, Knowledge and Innovation, Good Governance and Thriving Communities. Partnering with Embark Sustainability Society, SFU’s largest student sustainability organization, to provide support and help fund the University’s first ever Student Sustainability Summit, directly engaging with over 500 students resulting in a unique student sustainability vision and goals. Organizing three half-day community-wide Dialogue Sessions one at each of SFU’s three campuses. Each dialogue event saw attendance from a wide-range of SFU community members eager to share their input on the envisioning process. The five recurring themes mentioned above became the central discussion themes of the dialogue sessions. Supporting twelve community groups organize and run independent discussion sessions using the Community Conversation Handbook. Organizing numerous pop-up and pop-in events to engage with the SFU community at institutional events and open houses. Holding numerous one-on-one conversations with SFU’s senior leadership and topic-specific subject matter experts to get in-depth engagement feedback. Utilizing Facebook, Twitter, Instagram and other social media channels to encourage organic social media engagement. Drafting the first iteration of the University’s sustainability vision and goals using community input received throughout the engagement process. Phase 3: In the final phase of the project, the Sustainability Office worked to modify the drafted document based on an extensive vetting process that included a final round of community consultation and approval from senior leadership. Highlights include: Distributing second community-wide survey to the SFU community seeking feedback on the drafted sustainability vision and 20 goals. Filtering of the drafted document through internal University policies, national and global sustainability plans and commitments (such as the Province of British Columbia’s Climate Leadership Plan and the UN Sustainable Development Goals, etc.) to ensure they were consistent with existing best practices. Conducting ongoing consultation with SFU’s senior leadership and subject matter experts to ensure vision and goals were realistic yet challenging. Releasing SFU’s 20-Year Sustainability Vision and Goals at a community-wide launch event on March 1, 2017. What’s next? The SFU community, which created the sustainability vision and goals, will ultimately be responsible for the vision’s success, incorporating its principles within their studies, research, work and passion wherever possible. This envisioning document will also guide SFU’s upcoming 5-Year Sustainability Strategic Plan (2018-2022), setting concrete targets and milestones that will set the stage of making the long-term vision of sustainability a reality. The project officially began in September 2015 and was completed in March 2017. Sustainability Strategic Planning is mandated within SFU’s planning framework therefore costs associated with this process were anticipated and accounted for within the Sustainability Office’s fiscal year financial planning for both 2015/2016 and 2016/2017 budgets. Some of the significant costs associated with this project were: Hiring a temporary contract personnel to serve as data master, sifting through the incoming community engagement data. Hiring a digital marketing firm to develop, manage and launch the Sustainability Reporting Initiative (SRI) and annual maintenance fee for the upkeep of the website. Event management cost for the three campus-wide dialogue sessions including space rental fees, catering fees, audiovisual rental fees, videography and photography fees, etc. Financial assistance to Embark Sustainability Society for costs associated with preparing and hosting the Student Sustainability Summit. * Event management cost for the community-wide launch event including catering, event banner printing, videography and photography, audio and visual rental and set up, etc. The planning, engagement and release of the 20-Year Sustainability Vision and Goals reaffirmed SFU’s institutional commitment to sustainability, one of its six underlying principles. Furthermore, it demonstrated its commitment to taking an ambitious stance on how the institution can leverage its influence to positively impact its community in the decades to come. With the development and launch of the Sustainability Reporting Initiative (SRI), SFU’s sustainability history, progress and achievements are now available and accessible in a clear and concise manner online. This engagement process and the resulting 20-Year Sustainability Vision and Goals demonstrate the SFU community’s holistic understanding of sustainability as a concept. The vision and 20 goals are aspirational and touch on all realms of sustainability, balancing ecological, social and economic imperatives. The process and the product of the process, the 20-Year Sustainability Vision and Goals directly contribute to the City of Burnaby’s Environmental Sustainability Strategy (ESS) goal of fostering an environmentally aware and engaged community that works towards improving Burnaby’s environmental performance. In recognition of this, SFU was recently awarded the 2017 Environmental Star by the City of Burnaby for its 20-Year Sustainability Vision and Goals. The 20-Year Sustainability Vision and Goals set the stage for SFU’s next 5-Year Sustainability Strategic Plan. This plan, scheduled for release later this year, will focus on short-term goals and concrete targets that move SFU towards incrementally achieving the ambitious 20-Year Sustainability Vision and Goals. Targets will not only focus on operational sustainability but also on how SFU can leverage its unique position as a post-secondary institution to promote ecological, social, and economic sustainability within Canada and beyond. Engaging the community in the creation of the institution-wide 20-Year Sustainability Vision and Goals is integral to the long-term success of this project. By integrating the community into the planning process, the ownership of the document belongs to the community and not just the Sustainability Office. In this way, the community is able to and encouraged to incorporate the principles of the vision and goals within their studies, research, work and passion wherever possible. It is no longer simply the responsibility of the University administration to take the lead on sustainability issues but of the entire SFU community. Community building, diversity and inclusion, and mental and physical health in connection with the environment and consumption patterns were prominent themes discussed by the community throughout the engagement process. These reflect a growing awareness and understanding by the community of the interconnection between our natural and built environments, human health, social cohesion, equality, and economic resiliency. Post-secondary institutions have the capacity to implement sustainability principles and best practices within and beyond their institution’s physical operation, scaling social, ecological and economic sustainability principles by providing best innovative research and tools within and beyond their institutional boundaries. 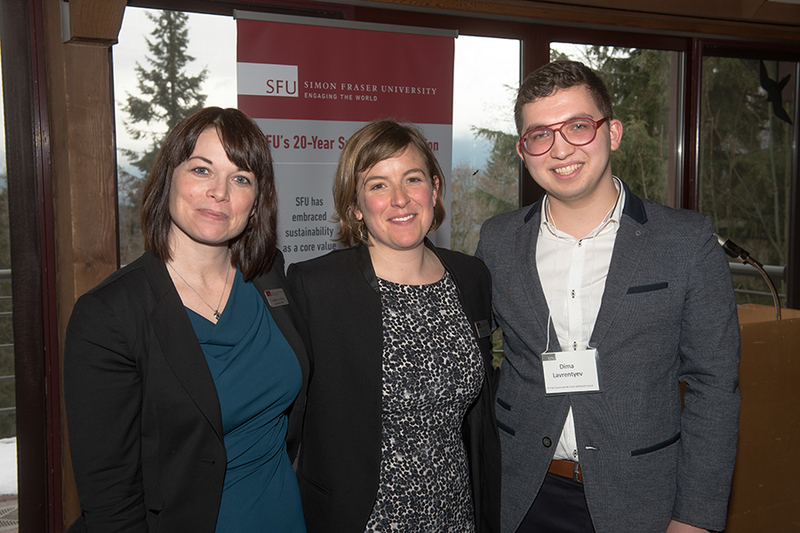 By providing the community with multiple opportunities and ways they could participate in the engagement process, SFU was able to reach a far greater sample of community members while developing its 20-Year Sustainability Vision and Goals. This engagement process broke down barriers such as age, occupation, experience and knowledge, encouraging the community to work together towards a common purpose. 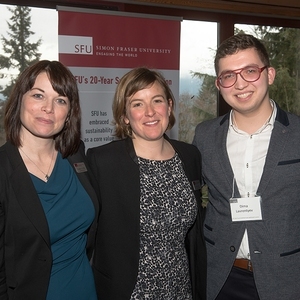 As one SFU student articulated at the launch event, “…we worked together in a joint venture…making the outcome much greater than the sum of its components.” The finalized vision and goals do not belong to one specific group, but to the entire community involved in its development.